One of my favorite quotes comes from an NPR interview with chef José Andrés: “If you want to get inspired you have to be on the move.” I am always searching for inspiration; I want to see everyday things in a way I didn’t before and discover the world’s hidden details. This quote speaks to my belief that getting out of the house, out of the daily routine, for a simple walk, with no intention in mind other than to wander, is essential for discovery. Furthermore, I am a proponent of being active and staying in motion. I’ve always loved a good walk. It's a way to clear the mind, be present in the world and learn something new. Walking has calmed me since I was a toddler. When I couldn’t go to sleep my parents would walk me around the house because it calmed my overactive mind. Thus the evening walk prevails in my life (not to be confused with post-lunch walks and morning walks; the latter preferably on a beach). This semester I’ve had the pleasure of embarking on a few evening strolls that have lead to many discoveries. 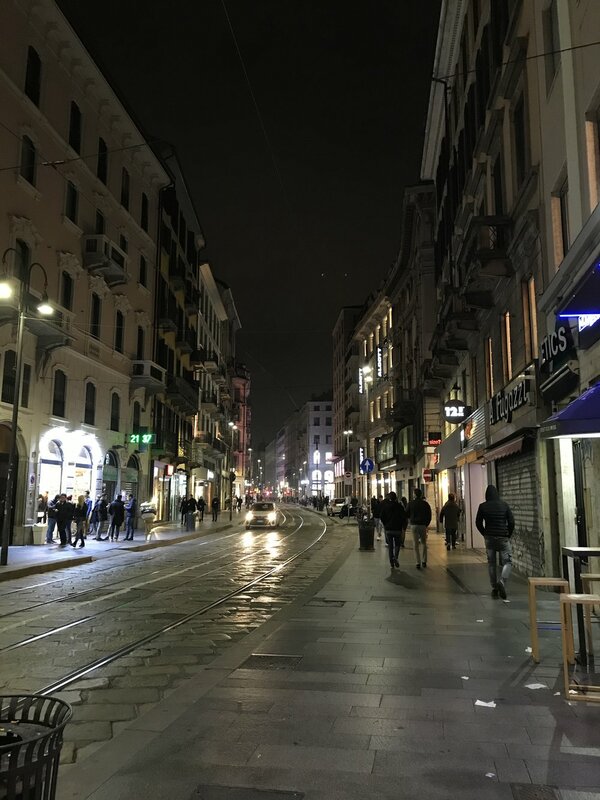 Although these walks happened in very different cities across Europe, the connection I found between them is that all cities follow a simple formula to an evening. The interesting part is how these cities differ in the way they treat the nighttime. Let me paint a picture of this formula: The aperitif hour ushers in the dinner hours with clicking glasses, excited chatter and the promise that anything can happen as the day slides into night. The conclusion of dinner brings soft, contented sighs and quiet voices heard over the last flickers of well-worn candles. At this point some parts of cities, gloriously food-comma’d, head home and recline on their couches for a relaxing night in. Others dim the lights but raise the volume of music, creating an atmosphere that could make anything can happen. I’ve seen all of these stages as I've wandered and it has been so interesting to see how cities vary in the way they treat this simple formula of an evening. So here are a few snapshots from my walks. And a few notes. I hope that through them you become inspired to take a few evening strolls of your own. Instead of the main event being restaurants and bars, the Old Town of Zürich is purposefully lit to highlight all of the churches and notable buildings along the Limmat river. This area of Zürich is pretty quiet in the evenings even though there are always people around. No one seems to talk too loudly or walk too fast at this time. Granted, there is a rule that quiet hours start at 22:00 (10pm) so I suppose that this could contribute to the muted tone of the evening. This is the Speicherstadt, the world's largest warehouse district built on timber-pile foundations, looking very eerie on a cool, damp evening. This place was silent except for a few tourists who came by to admire the brick monoliths. I loved the way the uplighting highlighted the artwork on the side of the building. Even though these buildings were not right next to each other the lighting connected the aesthetic across the plaza. Ah, the Reeperbahn. This street is the heart of Hamburg's red light district. I've never been to an area like this so I was pretty excited to walk through it. Hamburg's damp climate allows the neon lights to reflect off of surfaces you wouldn't expect. You are surrounded by color and glare sharply offset by dark as night corners and alleys. (Don't worry, Mom, I didn't walk this one alone.) The energy in the air was intense, thick like the fog on the Elbe, and I enjoyed being surrounded by people looking for a reason to celebrate. This was the most active nightlife place I experienced on my evening strolls. This is the view from clouds; the best rooftop bar in Hamburg (according to the bartender although I believe he was right). I was unlucky yet lucky when I arrived. Unluckily I missed the open rooftop bar season by one night. Luckily, I made friends with the bartender and still got to see it. Despite the 24/7 rainy weather, no fog had settled and I was treated to a clear view of the city. This picture is looking across the River Elbe to the shipyards. I was already impressed with Hamburg's beauty and this was the icing on the cake. The Naviglio Grande was beautiful at night. I explored this area in November so it was dark by the aperitif hour. People were all over, some getting drinks, but many just out for an evening stroll like myself. I was in a community of wanderers and we were all lazily soaking in the Italian evening. Later in the evening after the Italian dinner hours, in which dinner doesn't begin until 21:00 (9pm), I strolled through the center of the city. I was happy to see how many people were still out despite the fall chill. The Galleria Vittorio Emanuele II, the Duomo di Milano Italy and surrounding streets were alive and well. I love how these grand, public spaces are appreciated at night just as much as they are during the day. That's all for now, but more evening strolls will be coming soon. Thank you for reading!